Quiet your mind and relax your body with our luxurious Deluxe Silk Eye Pillow, lightly scented with soothing lavender. This 4” x 9” deluxe eye pillow is made from a beautifully pattered soft silk. These lavender eye pillows have something special that many suppliers don’t offer…our eye pillows are filled with organic flax seeds! You'll find the soft and cooling shape will contour to your face with gentle pressure while blocking out light. Perfect for deep relaxation and meditation, lavender scented eye pillows are also wonderful for relieving headaches and calming the mind. 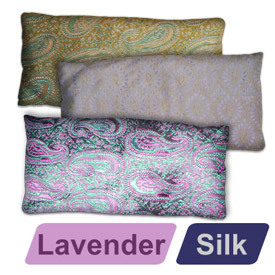 The deluxe silk lavender eye pillow is shown here, but the lavender eye pillow is also available in other sizes and designs. Talk with our friendly customer service representatives who will help you choose the best eye pillow for your yoga, meditation or relaxation practice. Love how it lays and the lavender scent. I've used these for years. The fabric is of high quality, they hold up forever. It's true that the candlelight color is not as pictured but it's still lovely. If color matters to you, do as I did and email customer service. The rep actually got the warehouse to take a phone pic of it and she sent it to me. Customer service is top notch. Word to management: simply get a more accurate color photo of the candlelight option! I purchased this as a gift for my daughter. She loves it. She is a yoga instructor and wish that I had gotten her 20 more just like it. Gave this as a gift. They loved it. Pretty item, but there was no lavender scent at all. I have added my own using oils. I loved it. It smells so good. I use it sometimes at night when going to bed besides in my yoga practice! I love this eye pillow. It is so well made and the color is so calming. good addition foo my yoga practice. I ordered several of these in different colors for myself and for gifts. They are lovely, especially the purple. I love the lavender scent. Pillow is large enough to cover the eyes well and the material is luxurious. The "candlelight" color as show on the Deluxe Silk Eye Pillow is misleading and disappointing. The actual color is a soft pale yellow. In addition the dimension which state 4" by 9" is actually only 3 1/2" wide by 8 3/4" in length. I love the benefit of eye pillows and was looking forward to this little bag of retreat and this product did not stand up to my expectations.